I’ve been shopping for pocket charts and more! I spend an absolute fortune every year on classroom resources. I just can’t help myself! There are so many things that Infant Teachers need! Ok, well that’s how I justify it to myself at any rate. I own a serious amount of classroom resources. If I moved school in the morning my current classroom would be almost bare. Seriously, it is almost all my stuff! I have had a pocket chart obsession for the last 8 years or so. My good friend Arial organised for John and Jan to bring over a “HUGE” one for me when they visited from Florida. It has been a serious blessing and my very best friend ever since. Here she is. Isn’t she lovely?! I have been using it day after day as part of my Classroom Management programme. 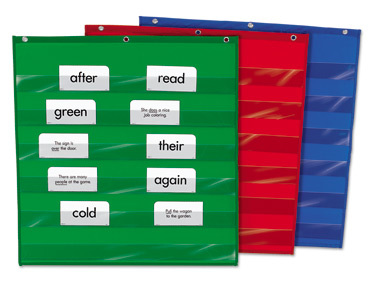 With up to 34 children in an Irish Infant classroom you would need a very large pocket chart to display all the names!!! I decided a few weeks ago that I needed another one. I checked on bookdepository. com and found that they don’t have the sizes I want available 😦 Still, not to be deterred from my mission of getting a new pocket chart I took a gamble. I arrived on Friday! It’s the Daily Schedule pocket Chart by Scholastic. It cost 9.62 euro gamble. Click here for a link. I am not entirely certain what I am going to use it for. It is a lot smaller than I had expected. I will certainly blog about it when I do! The Magic Wipe Off Strips were only 2.99 Euro in my local Teacher Supply Shop. I bought some markers and the dottiest little eraser to go with it. The phrase cards fit perfectly in the pocket chart but cover two pocket. The pockets are extremely shallow. 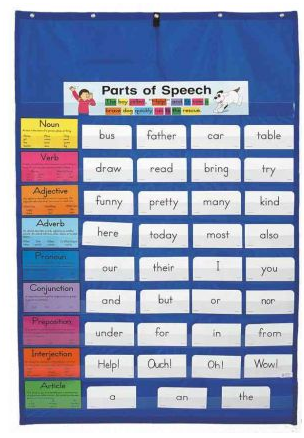 Isn’t it crazy what we can purchase the sentence strips that are designed to go into pocket chars but not the pocket charts themselves in Ireland?! Have any of you seen them for sale? This is my heart’s desire! A mini pocket chart! How fantastic would it be for “The News” or creative writing? It is a lot wider than the one that I purchased. Don’t be deceived by the photo above. 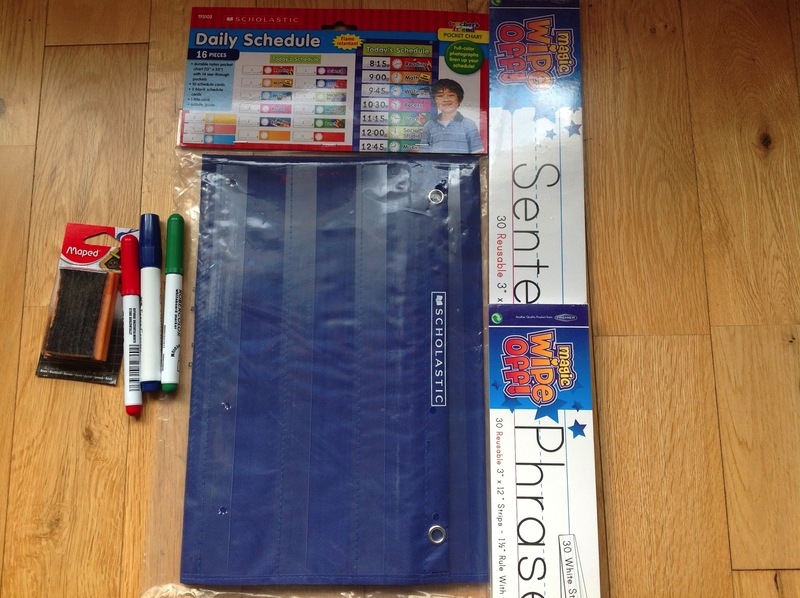 StilI, I cannot wait for Monday after school so I can figure out how to best use my new purchases!